Kyler Murray’s nameplate was prominent above the locker. His uniform was hanging from the stall. The Oakland A’s spent Monday morning talking enthusiastically about Murray arriving this week at spring training camp. It came crashing down at 12:46 p.m. ET. That’s when Murray, the Heisman Trophy-winning quarterback, revealed to all that he’s done with baseball. His future is in the NFL. “Moving forward, I am firmly and fully committing my life and time to becoming an NFL quarterback,” Murray tweeted. Not that Murray chose football, but that he did it on Monday, even as the team said it was still negotiating with Murray. “We’ve known all along this was a possibility,’’ A’s GM David Forst said. “We’ve been talking to Kyler since the day we drafted him. We knew he had a great option in the NFL. We’ve known how much he loves football and what a great position he put himself in with an incredible year. The A’s were convinced Murray would give up football and play baseball when they selected him with the ninth-overall pick in June, giving him a $4.66 million signing bonus. They spent hundreds of hours scouting him. They were assured by him, his family and representative Scott Boras that he would play baseball. They were permitting him to play football for his junior season at Oklahoma, pray he didn’t get hurt and then watch him develop into an All-Star caliber outfielder. 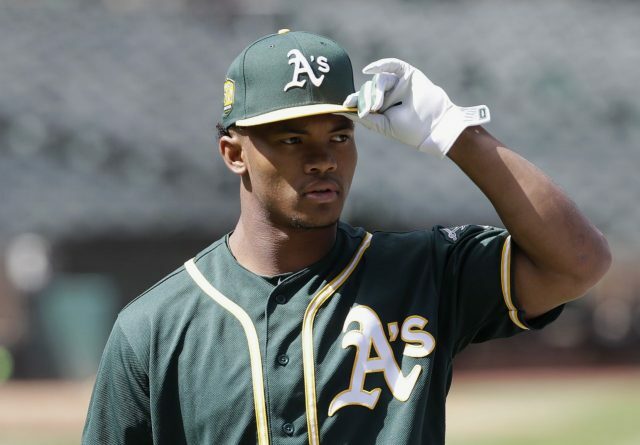 “Things certainly changed since the (2018 MLB) draft, given his amazing football season,’’ A’s president Billy Beane said an hour before Murray’s announcement. “It’s based on a historic college football season this young man had. To not recognize that would be somewhat foolish. “He’s a Heisman Trophy winner. He’s projected to be an early pick. We’ve had ongoing conversations as it relates to Kyler’s future. Period. Not just with baseball but potentially with other sports. The plans solidified with Murray’s tweet. Although the A’s placed Murray on the restricted list, they retain the rights to him. Murray will surrender all but $200,000 of the $4.6 million signing bonus. But the first-round draft pick is gone. Taking Murray was always going to be a gamble, and the A’s hold on him looked more and more tenuous as the college football season went on. The A’s, trying to stop the NFL momentum, even met with Murray and his family a month ago in Dallas. They were willing to renegotiate, providing him a major-league contract. They even brought in an MLB marketing executive to help their cause. It was of no use. The A’s remain open to Murray having a change of heart or coming back to baseball if he washes out in the NFL. But the longer he stays away from the game, the more difficult it will be for him to reach the majors. He’s simply too raw. He’s too inexperienced. He won’t have enough time to make up for the plate appearances he’ll be losing. But even Bo Jackson, arguably the great two-sport star in history, changed his mind. Jackson was a Heisman Trophy winner in 1985 and snubbed the Tampa Bay Buccaneers after being selected with the first overall pick. He instead chose baseball and the Kansas City Royals. I covered Jackson every day for the first three years of his professional career. We talked all of the time. He had no intention of playing football again. He changed his mind at the 1987 All-Star break. The Los Angeles Raiders were willing to let him play once the Royals’ season ended. And the marketing money Nike was willing to pay him to be their spokesman playing both sports, launching the “Bo Knows’’ campaign, made it impossible to turn down. The two-sport ride ended in January, 1991 with a career-ending hip injury. Murray surely has done that, and no matter how much the Athletics tried, they couldn’t take away his love for football. “He’s going to have a nice, little NFL career,’’ Melvin said, “and we’re going to be rooting for him. He’s a good kid. When you win the Heisman Trophy, pretty good chance you’re going to play football.